Crown Point from Women's Forum State Park - a threatened view? 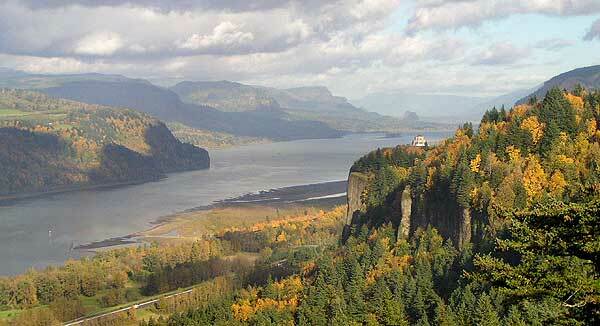 According to the Columbia Gorge Commission website, the Vital Signs Indicators Project is “identifying several measures to assess changes in the scenic quality of the Gorge over time.” Translated, this means that the Gorge Commission has set up a web survey to poll the most popular Gorge vistas among the traveling public. The survey allows “up to three” favorite vistas for each of Interstate 84, Highway 14 and the Historic Columbia River Highway. Wait..! Just three? Do we really have to choose? Well, yes. And according to the Commission, “the views with the most votes for each roadway will be included in the list of key Gorge views that will be monitored in the future by the Commission.” So, your votes matter, at least for this effort. The good news is that this project is intended to help the Commission cope with man-made eyesores that mar scenic vistas, as well as “vegetation management”, so that views like the classic scene from Women’s Forum Park (above) aren’t blocked over time. Thus, hard as it might be to choose, you should take a moment to visit their website and take the survey. It will take you 10 minutes, or so, and you’ll be helping the Gorge in a small way. The survey runs through December 5, 2008, and after that, you’ll have to settle for reading the results. Here’s the link to the Gorge Commission website. Comments: Comments Off on We have to choose?